OMEGA Engineering does not use reprocessed PFA or PVC in manufacturing any thermocouple wire. Use the table below as a guide for types available. The "To Order" box contains some examples of popular models. Use the "Part Number Builder" (Below Table) to get pricing for all available models. †Weight of reel and wire rounded up to the next highest Kg. (does not include packing material). 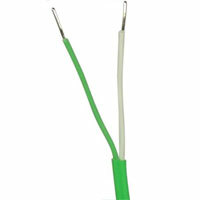 ***Two insulated conductors bonded together in figure of eight style, with no outer sheath. Some wires available with Class 1 Tolerance; consult Sales for pricing and availability. Additional Type K insulated wires are available. See Fused Tape Insulated TFE-K and KK-K Series. 7.5 metres, PFA-Insulated, 0.5mm dia. conductors, Type K.
15 metres, PFA-Insulated, 0.5mm dia. conductors, Type K.
100 metres, PFA-Insulated, 0.5mm dia. conductors, Type K.
300 metres, PFA-Insulated, 0.5mm dia. conductors, Type K.
7.5 metres, PFA-Insulated, 7 strands of 0.2mm dia. conductors, Type K.
15 metres, PFA-Insulated, 7 strands of 0.2mm dia. conductors, Type K.
150 metres, PFA-Insulated, 7 strands of 0.2mm dia. conductors, Type K.
300 metres, PFA-Insulated, 7 strands of 0.2mm dia. conductors, Type K.
7.5 metres, Glass Insulated, 0.5mm dia. Conductors, Type K.
25 metres, Glass Insulated, 0.5mm dia. Conductors, Type K.
150 metres, Glass Insulated, 0.5mm dia. Conductors, Type K.
300 metres, Glass Insulated, 0.5mm dia. Conductors, Type K.
7.5 metres, Glass Insulated, 0.25mm dia. Conductors, Type K.
15 metres, Glass Insulated, 0.25mm dia. Conductors, Type K.
7.5 metres, Glass Insulated, 0.13mm dia. Conductors, Type K.
7.5 metres, Hi Temp Glass Insulated, 0.5mm dia. Conductors, Type K.
15 metres, Hi Temp Glass Insulated, 0.5mm dia. Conductors, Type K.
150 metres, Hi Temp Glass Insulated, 0.5mm dia. Conductors, Type K.
25 metres, PVC Insulated figure of eight style, 0.5mm dia. Conductors, Type K.
50 metres, PVC Insulated figure of eight style, 0.5mm dia. Conductors, Type K.
300 metres, PVC Insulated figure of eight style, 0.5mm dia. Conductors, Type K.